Goodwood Oval needs a new grandstand and club and change rooms for the football and cricket players. New change rooms are essential to cater for female players. The trouble is a new facility is hugely expensive; not a cost that Unley Council can solely bear. Labor candidate Jayne Stinson and Liberal candidate Lachlan Clyne are pursing the matter and are drumming up support from within their parties. Jayne recently took Treasurer Tom Koutsantonis to the oval and gave him a tour of the ageing facility. Tom loves his footy and his presence signalled Labor's need to retain Badcoe. Will Lachlan now take Steven Marshall down to the oval to view the facilities? To get the votes, all Labor and Liberal need to do is to commit to funding of $2m+. A big ask, but a win in Badcoe is important to both parties. Thinking about it, I wonder just how many votes are at stake. Funerals are just so expensive. Even when you have a modest one with few frills, the Funeral Directors fleece you with high markups when you are most vulnerable. If you select a cremation at Centennial Park, the Funeral Directors add a whopping $500+ extra; for doing nothing other than making a phone call to Centennial Park. Now there's a new player in the funeral business. A company called Value Cremations will collect the body, handle the death certificate and cremate it for a low cost of $1,500. There is no service or gathering to farewell the person. You simply collect the ashes and do whatever you wish with the plastic urn eg. go for a Sunday drive and scatter the ashes in a nice quiet country setting or from the top of a cliff along the coast; or you can just place the ashes on a shelf at home and wonder for years what to do with them. However it does have appeal. Germany’s Kaufland buys Le Cornu site, Forestville, for $25m to set up giant 20,000sq m supermarket. Wow. That's huge and will probably fill the whole Le Cornu site. Kaufland builds mega supermarkets that are typically 4-5 times the size of a Coles or Woolworths store. A positive outcome is that there won't be an 8 storey building (or will there be apartments above?). A negative outcome is the huge influx of cars bringing shoppers. The traffic impact on local streets will be heavy. Greek food has had a huge impact on Aussie eating. My favourites are charcoal grilled octopus and lukoumades. Lukoumades (or honey puffs as I know them) are made in heaven; Greek heaven. They are commonly described as Greek donuts and are smothered in honey and walnuts; and they must be served hot. Between you and me, the abundance of lukoumades is the prime reason for me attending the annual Greek festival in Oxford Terrace, Unley. 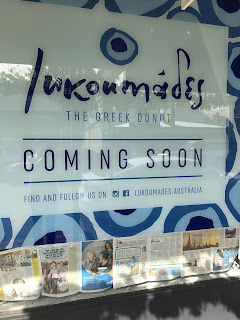 I was delighted to find a sign in a shop on King William Road that proclaimed that the restaurant Lukoumades would be opening soon. It should be hugely popular with entrees, mains and desserts of Greek honey puffs. Football is a funny game, as they say. A team is on top and playing well one week and then fails to perform a week later. The Crows went down today, big time, against the Tigers. They started as favourites and lost the AFL Grand Final. They started well in the first quarter, but then went down hill. Commentators continually said that they were spooked and gave away so many frees. Yes they did, but why weren't the Tigers equally spooked. Both teams were new to a Grand Final. Maybe the Tigers had better prepared mentally. On the day, the Tigers were the better team. A much better team. They played a fast and disciplined team game. The Crows just lost their mojo; and looked spooked, mentally shattered. Given what I saw, I wouldn't be surprised to see the Tigers (Richmond) return next year for a gig at the AFL Grand Final. 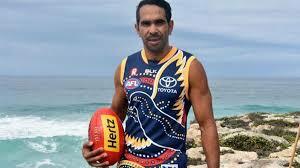 As a Crows supporter I was devastated. It wasn't just the team not winning; they let us down.